According to a new study in the New England Journal of Medicine, air pollution is still a major killer in the United States. Each year, as many as 12,000 people die as a result of air pollution that falls within the legal limit set by the Environmental Protection Agency. While many Americans are opting to live in more environmentally friendly manner, even the most environmentally friendly person can still make a huge contribution to the greenhouse emissions and particle pollution that is devastating the lives of thousands. This guide is designed to give you a few quick tips to reduce the environmental effect of your trip. Travel Greener It is no secret that the automobile is a huge contributor to the level of pollution of a local area. Unfortunately, most regions do not have a well enough developed mass transit system (trains, buses, etc.) to enable people to commute, or even perform basic needs like grocery shopping, without a car.When on vacation, however, there are significantly more options in order to travel greenly. Charter Bus services are a phenomenal example of low impact travel. 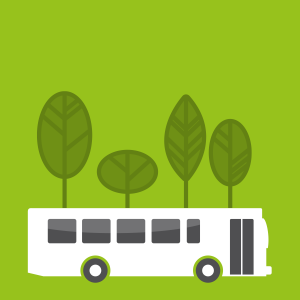 In fact, a full motorcoach can potentially remove 56 cars from the road which, aside from cutting down on traffic, can greatly reduce emissions.Especially if you are planning a group vacation or a family reunion, coach bus rentals are the best option available, and will extend the quality time spent together. A Green Fire While campfires are deeply rooted in America’s psyche, and let’s be honest (who doesn’t love s’mores), campfires can have a surprisingly potent effect on local levels of air pollution. That is because burning wood creates particle pollution, which is the most damaging type of air pollution.The best way to reduce the effect of your fire is to practice better practices. Use seasoned wood and only build small, hot fires. Bonfires and other large burnings are significantly more damaging to air quality. Don’t Abandon Your Usual Green Practices It might be tempting to grab a plastic water battle on the road, or allow the cashier at the rest stop to throw your purchases in a plastic bag. But just because you are on vacation from work doesn’t mean you have the freedom to abandon your principles.While it might seem too difficult to be green on the road, it’s more a matter of preparation and a willingness to stick to your convictions. Cardinal Buses, Inc. is a family owned bus company with facilities in Middlebury, Indiana and Holland, Michigan. We operate a fleet of modern motorcoaches with seating capacities of 24, 38, 48, and 56 passengers. Four of our 56 passenger coaches are equipped with lifts and wheelchair securements to accommodate handicapped passengers. How Can I Plan A Great Business Trip Without Going Over Budget? Copyright CardinalBuses. All Rights Reserved.